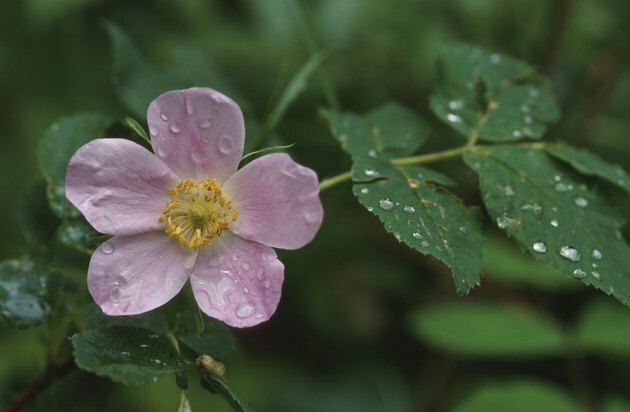 Rose hip oil comes from the seeds inside the fruits (hips) that develop at the center of wild roses. These seeds are harvested from the hips in the fall after a frost, then pressed to extract the oil, which can be used as a remedy for damaged skin. The process of cold-pressing rose hip seeds uses a screw-driven machine to extract the oil instead of using a chemical solvent such as petroleum-based hexane. Knowing whether cold-pressed rose hip oil is genuine is important because it retains more beneficial antioxidants and essential fatty acids than chemically extracted oil. Look at the bottle the rose hip oil came in. It should be blue or brown glass, not clear, to limit the amount of direct light reaching the oil, which can make the quality deteriorate faster or turn the oil rancid. Read the label closely for clues. Try to determine where the oil was produced and look for any "organic" statements. You may find certified organic labeling or a statement on the label that the product is expeller- or cold-pressed. The ingredients should list 100 percent cold-pressed rose hip oil. If you see chemicals or additives, then the oil is probably not cold-pressed. Check the directions on how to use and store the rose hip oil. If the directions say an opened bottle will last for more than 90 days, then the manufacturer used chemicals or preservatives, and it may not be genuine cold-pressed rose hip oil. Open the bottle and take a whiff. The oil should have a distinct odor but not a sweet rose fragrance. If you smell roses, the manufacturer added fragrance, and the oil probably is not genuine rose hip oil. Contact the manufacturer to ask questions about the oil or to clarify any of the statements on the label. The label may provide contact information such as a phone number or website for consumers. What Kind of Oil Is Safe to Use for a Sewing Machine?